Join us on Wednesday 29th November to help form our new group! 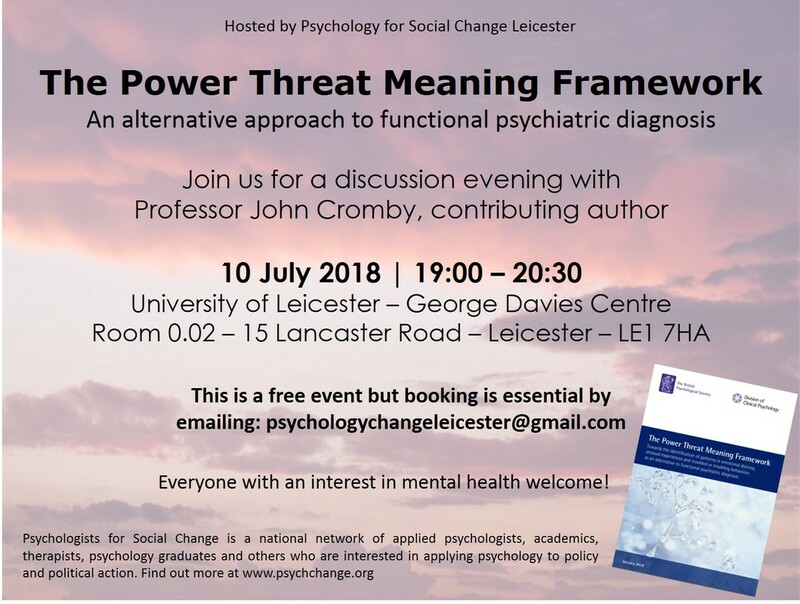 Our inaugural discussion evening in Leicester was widely attended and there was a lot of interest in setting up a Psychologists for Social Change group in Leicester. We'd like to invite you to our second meeting to think together about the name, identity, focus and purpose of the new group. To generate discussion and include the voices of those unable to attend the meeting, we have set up a Google document for anyone who would like to comment on these ideas. Feel free to add your thoughts in advance of the meeting. Please email rj170@le.ac.uk to let us know you are coming. We look forward to seeing you there! a sticking plaster or an opportunity for transformative change? A discussion evening in Leicester: Tuesday 10th October 2017 from 7pm. 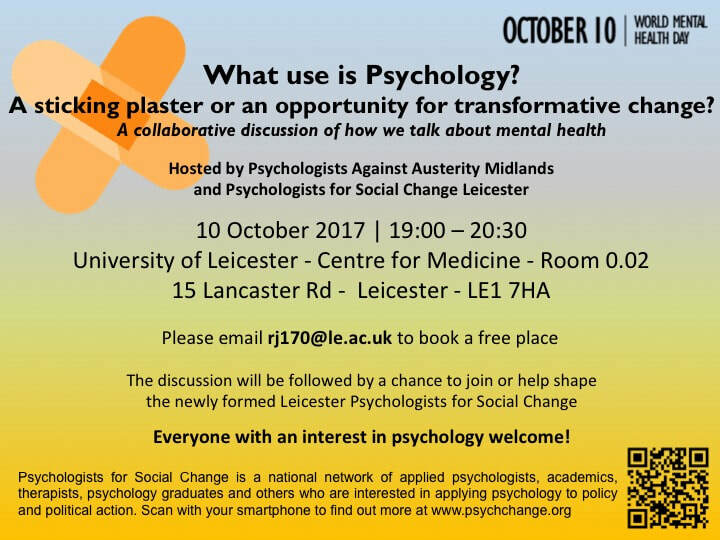 For World Mental Health Day, Psychologists Against Austerity Midlands and Psychologists for Social Change Leicester are hosting a free discussion event open to everyone with an interest in thinking about the application of psychology for political action and policy change. Everyone who attends will have the opportunity to contribute to the discussion throughout the evening. We hope the theme will encourage a rich reflection on the ways in which we have become used to hearing and talking about mental health in mainstream forums. We also hope that others based around Leicester will feel inspired to help us shape the newly formed Psychologists for Social Change Leicester group.